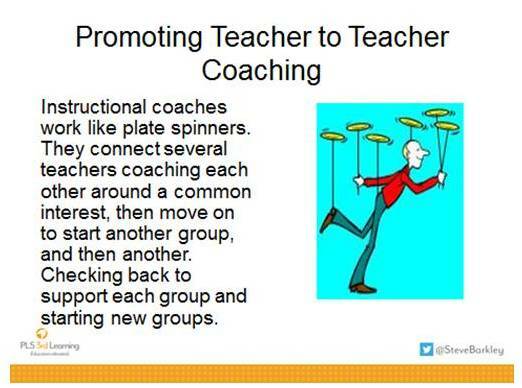 It’s important that principals’ work with instructional coaches to extend the coaching culture in a school. That culture increases the impact that the coach can have in providing feedback and reflection opportunities as well as increasing the coach’s role in being the “coach of coaching.” Anyone working in a coaching leadership role (instructional coach, team leader, department head) should be increasing the amount of teacher to teacher coaching occurring in the school. I am working in a district that has instructional coaches for the first time this fall. On my first follow up to a summer training I conducted with them, I requested questions and concerns that they wanted me to address. Here is one that I received. My principal believes the teachers were preparing their lessons for my observations when they knew I would be there, so he asked me to not tell them ahead of time (so we don’t have pre-observation conferences). My response was that the principal had put this new coach into a supervisory role which means many teachers will even believe it is an evaluation role. (Teachers will assume that the coach is reporting her observations to principals who will use the information for evaluation.) New instructional coaches need to exaggerate a non-supervisory role to gain teacher vulnerability that leads to trust and teacher growth. They need their principals to help communicate that message. The pre-conference is critical to coaching as it is where the focus of the coach’s attention is agreed upon with the teacher. My description which seemed to provide concreteness for the new coachers was this statement: For the teacher to perceive the activity as coaching, when she sees the coach writing and recording during the observation, she knows what is being recorded. If she doesn’t the activity is more supervisory. *4th and 5th grade classrooms are using peer teaching with students. They agree that it is important that peers support; not tell or do for their classmates. At the PLC they agree that whatever time the coach has available, she will stop in and record any peer conversations she finds. Two weeks later when she provides the information at the PLC, it is interpreted by the team as coaching. The PLC will use the information and any of the coach’s insights to decide next steps. *The entire staff has been engaged in exploring the role of teacher questions and student questions in advancing learning. 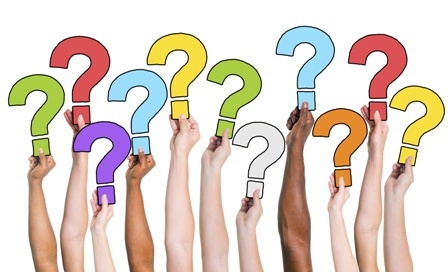 (PD workshop and PLC conversations) At the faculty meeting the principal might announce that he has asked the instructional coach and department heads to visit classrooms and record teachers’ questions and students’ questions. The lists of questions are given to each observed teacher. As often as possible and at PLC sessions, time for teachers to reflect on the data will be provided. The feedback is coaching, important for supporting individual teacher and collective staff growth and change. 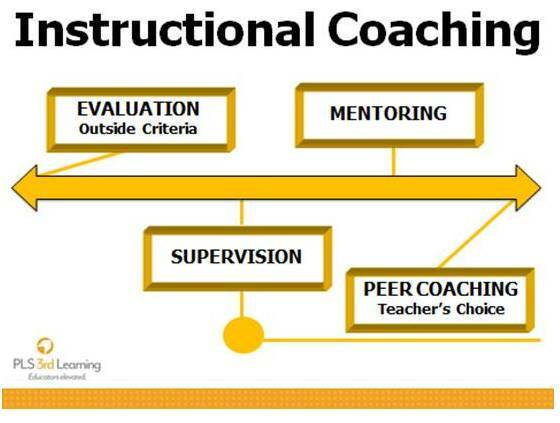 With a culture of coaching in the school, an instructional coach can begin to arrange opportunities for teachers to be peer coaching each other. An instructional coach uses an Ipad to record beginning readers’ fingers tracking words as they read. She captures their reading as well as their teacher’s response when they stop on an unknown word. At grade level PLCs the coach shares 5 minutes of a teacher’s work and the teacher reflects on what she sees and can seek thoughts from her teammates. Peer coaching in action! One of my favorite examples of peer coaching “as a way of doing business” came from a teacher new to an international school. After a few weeks at the school the teacher was called to a meeting where she was informed that an autistic student would be enrolled in her class in a few weeks. Shortly after the meeting she emailed the staff in her school informing them that during the next two weeks her classroom was open for observation at any time. She requested that her colleagues observe and leave her a note identifying things in her practice that they thought would be helpful to the new student and any structure or practices that the student might find difficult. Peer coaching requested! What are your purposeful leadership behaviors to promote a culture of coaching increasing teacher to teacher coaching?